I love being a mother. I fell in love with all my children even before they were born. I loved feeling them move inside me and dreamed about what they would look like, what their personality would be, and what their future might hold. My kids haven’t changed a lot since they were little. The moment my first child was born (I have four), I devoted my life to being the best mother I could, which wasn’t always easy. Now that my children are grown and have kids of their own, it’s easy to see where I went wrong (after all, hindsight is 20/20). 1. Spend one-on-one time with your kids, even if you have 10. 2. Make them feel important, loved, and safe. 3. Set boundaries. When you say no, mean it. 4. Give them a daily chore, even if it’s just picking up the front room. 5. Tell them you’re proud of them. 6. Encourage them to try new things, everything, until they find something they like to do or are good at. 7. Don’t try to be their friend. You can’t be their mom and their friend at the same time. 8. Ease their fears by being open with them and answering their questions to the best of your ability. 9. Teach them manners and to respect others; the Golden Rule. 10. Set a good example. Give them someone to look up to. 11. Don’t talk bad about their fathers, or anyone for that matter. 13. Tell them you love them every day. 15. Don’t set your expectations too high for your children. Looking over this list, I can say that some of my parenting skills may have been lacking, but we learn as we go. No one is perfect. I may not have been able to give my kids the world, but at least they knew they were loved. This year I received a letter from my youngest daughter, Lori, that made me realize that I must have done something right. “… Having my own children made me look at my mother in a different light. Everyone wants to be a better parent than their own, do things differently. And while that is true in some aspects, I also want to be just like my mother in many ways. Even though my mom was dealing with her own issues while I was growing up, I always felt love radiating from her. I know she was proud to have us as her children, and she would do anything for us. And I feel the same exact way about my own kids. I think every mother does. But what my mom has taught me in the last ten years has had more of an impact on me than I could ever imagine. She not only quit drinking, she changed many of her destructive habits as well. Don’t get me wrong, she’s not perfect and she knows it. And I don’t think I could deal with it if she was. But she has taught me a lot of life lessons that I want to instill in my children. Out of all of my children, Lori is the most sensitive. We are like two peas in a pod. 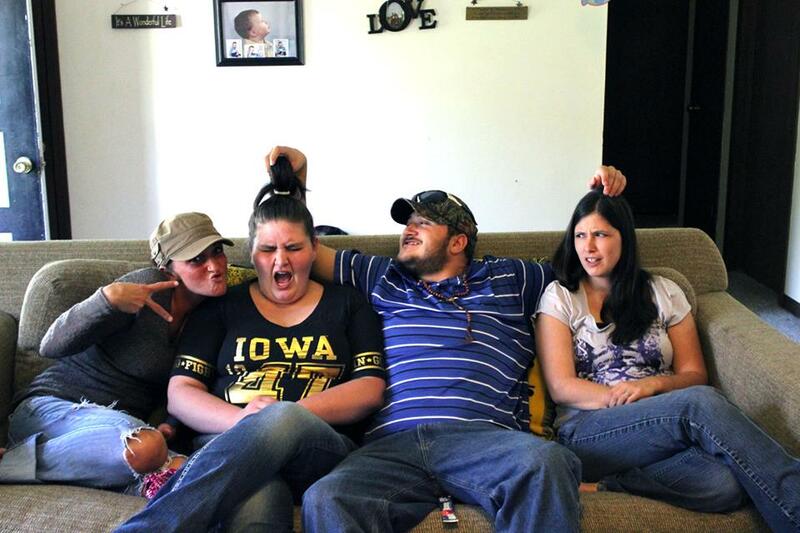 It’s not that I don’t love my other children any less,it’s just that Lori and I share a very special bond. I think the greatest gift I could ever have received, especially on Mother’s Day, is the gift of being appreciated. It makes being a mother that much more rewarding. You are there for your kids from the moment they are born, teaching them to walk, to talk, kissing their owies, teaching them to tie their shoes, and to ride the bus alone for the first time. You’re there holding them while they cry after their first break-up, and helping them get dressed for their proms and weddings, and holding your grandchildren for the first time. When you’re a mom, you take care of your kids because that’s just what you do. You love them unconditionally because they are a part of you. You created them and you raise them to the best of your ability. And when it’s time to let them go, well…. that’s a little easier said then done. But you never really let them go. You just make them think you do. 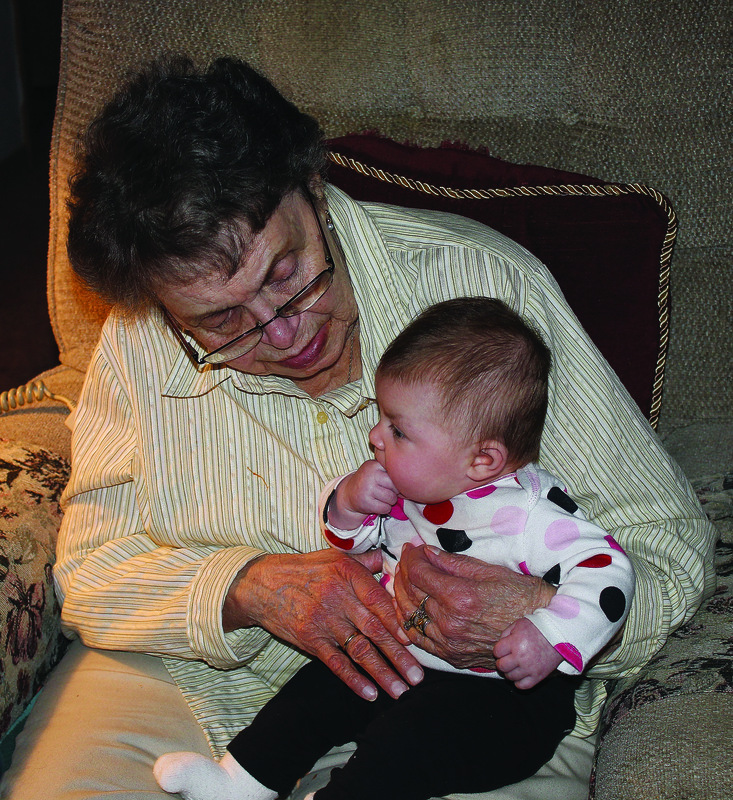 My mom with her great-granddaughter. mothers with simple, at-home gatherings. When the holiday began to attract commercial attention in the following years, Jarvis became upset and protested what Mother’s Day had become. She believed that it was taking away from the true intention of Mother’s Day, which was to show loving displays of gratitude for mothers and grandmothers. The love a mother has for her children has not changed over time. Stories through the ages tell of the sacrifices mothers endured, the unconditional love that enabled some children to overcome challenging obstacles, and the miracles that followed. Some famous mothers through time include Eve, who was the very first mother. The Bible tells the story of how she disobeyed God by eating the forbidden fruit, and she and her husband, Adam, were banished from the Garden of Eden, their paradise. She had two sons, Cain and Abel, and had to endure the pain of childbirth and the heartbreak of losing a child, while having to accept the fact that one of her children was a murderer. Mary was the mother of Jesus of Nazareth. She stood by him through thick and thin, even as he was ridiculed for his insistence that he was the son of God. She believed in him, even as he was crucified and died on the cross, and accepted that this was his fate, for all mankind. Mother Teresa was made a saint for helping lepers in India. Though she had no children of her own (she had given her life to God as a nun), she was a mother to all, caring and nurturing the young, the old, and the sick. She lived in poverty, among the lepers, and taught others to be loving, generous, compassionate, and kind. Rose Kennedy, famous mother of the president of the United States, approached her mothering duties almost like a sports team manager, keeping records of everything from kids’ dental visits down to their shoe sizes, according the John F.Kennedy Presidential Library and Museum. She lived to be 104 years old, outliving four of her nine children, all of whom died in tragic circumstances. Her oldest son, Joseph, was killed in action in World War II in 1944, and her daughter Kathleen died in a plane crash four years later. John was assassinated in 1963 and Robert was assassinated in 1968. Actress Angelina Jolie takes her role as a mother very seriously. She and actor Brad Pitt adopted four children from various countries and then had twins five years ago, bringing the total number of children to six. But not only has Jolie had a tough role as an actress and a parent, but she made the decision to have a double mastectomy to avoid breast cancer. Her mother died of ovarian cancer in 2007 and Jolie wanted to do what she could to prevent that from happening to her. Jolie said in Elle magazine that her daughter, Vivienne, was cast in the role of Little Aurora in the her new movie, “Maleficent,” but the stress of working with their children was almost too much, and they decided maybe that’s not the best thing for them. And then there are the fictional mothers. TV moms like June Cleaver, Carol Brady, Roseanne Connor presented the changing roles of mothers through the decades. June Cleaver was the mom in the TV show, “Leave it to Beaver.” Mothers then (in the 1950s) were depicted as woman who did not work outside the home and keep the house spotless, and shopped a lot. As a mother, she was pretty awesome, but almost too perfect. Carol Brady branched out in a new role as stepmother in a blended family in “The Brady Bunch,” something that was unheard of until the 1970s. Being a mom in that situation was often hilarious, but there were some serious moments, too. Carol showed other moms in that situation how it was done. Shirley Partridge was a single mom in “The Partridge Family,” but she showed the world she could do just fine on her own, without a man. She was both mother and father to her five children. She had it rough, especially with their lifestyle as a musical family. But the show did hit on a few lessons that could be learned by the moms in the audience. Claire Huxtable was the mom on the “Cosby Show” in the 1980s. Though she worked professionally outside the home, her five children were well-behaved. They had their problems, but her role as a black professional working mother helped other black women see that they, too, could work full-time and be a good mother. Roseanne Connor showed a realistic scenario for the 1990s mom. A quick wit and a sarcastic attitude showed moms that life does not come with a handbook, and sometimes you have to improvise in order for it to work. Mothers have an undeniable bond with their children. It is an unconditional love that stays with them until the day they die. And if we do it right, our mothers aren’t honored just one day a year, but every day. Maybe it’s a phone call out of the blue, or a surprise delivery of flowers. Perhaps she would like a frappuccino from Starbucks (with lots of whipped cream!). But most likely it’s the time you spend with her that matters most. Maybe just talking with her, laughing about the funny things that happened when you were little, or maybe just holding her hand and telling her that everything is going to be all right. Maybe that’s all she really wants this Mother’s Day. Take a few moments this Mother’s Day to sit down and really talk to your mom. And don’t forget the frappuccino. I thought my daughter would have a tough time with newborn twins, a 5-year-old who never sits still, and a 9-year-old on the verge of puberty. But I now know I have nothing to fear. She handles it very well, and though she still doesn’t get much sleep, she has the twins routines down pretty good. After having Isabelle, a very colicky baby who didn’t sleep through the night until she was almost 1, the twins, she says, are a breeze. I have watched the twins a few times since they were born, and I always walk away with a higher respect for mothers who have multiple babies. I had four, too, but they were spaced out. My three girls were all about two years apart, and my son was born four years after my last girl. I can’t imagine what I would have done if one of them had been twins. 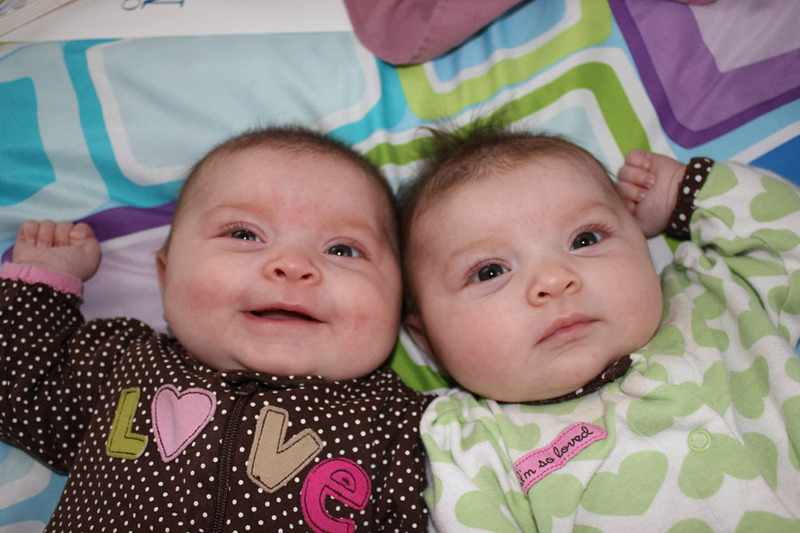 My daughter’s twins are now at an age when they are cooing and smiling and are more aware of their surroundings. They’re starting to get their own personalities. Gianna is excited about everything, while Natalie is more laid back. But when they want something, they both want it NOW! They slept most of the time in their first few months of life, but I think that’s all about to change. I recently watched them for a few hours and they seemed to tag-team me the entire time. When one was hungry, the other wanted changed or held or burped or held or fed or changed…..I really don’t know how their mother gets anything else done. My mom had nine children and I once asked her how she did it. “I had to. I didn’t have any choice,” she said. I think my daughter is finding that out for herself. We do what we have to do because we’re mothers, but the rewards far outweigh the problems we face. And besides, twins are most definitely twice as nice.